Are you a busy man who don’t have much time for motorcycle touring but you really wanna try a great motorcycle ride including all the bikers’ needs: getting far away from hustle and bustle, offroad motorbike ride or being off the beaten track…? 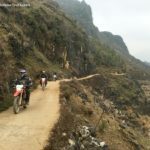 This short Vietnam motorbike tour from Hanoi can meet fully your wants and needs! The tour starts and ends in Hanoi so there’s no better way we have to ride some first kilometers in busy traffic to get out of the city. So this ride is not easy for the novice. Start the motorbike tour in north Vietnam from your hotel at around 8:30AM, Ride motorbike up to the north of Hanoi on the red river dyke road, passing the some rice paddies then get to Son Tay town( 40 km from city center of Hanoi) where we stop to visit the peaceful ancient village of Duong Lam before keep riding up north to the mountain area of Yen Bai and Son la province. The motorbike ride become more and more relaxed and enjoyable in the afternoon when we get higher and higher on the mountain where traffic is almost empty and the scenery is amazing. 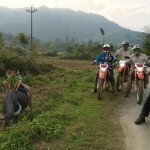 As a Vietnam Motorbike Tour Expert we will take you on longer and much more rugged roads down to Doan Hung town. It’s about 80 km in length but offers you 80% offroad ride, It is short but could be unforgettable offroad motorbike ride in Vietnam. Then from Doan Hung town we keep riding on the backroads along the river dike down to Hanoi. Arrive Hanoi and finish short Northern Vietnam motorbike tour at around 5:00 PM.